A shrill voice cuts through the hum of one of China’s largest traditional medicine shops: “Buyao zhaoxiang!” — photos forbidden. Scowling, the white-coat clad worker points an accusatory finger towards a sign displaying a large red X printed over the image of a camera, tacked over the rows of brightly lit glass cases. Inside these cases, nestled on beds of yellow and red satin, are an array of dried creatures and their products: sea cucumbers and lizards, bird nests and deer musk. At Beijing’s Tong Ren Tang, a traditional medicine department store, pharmacists are quick to shoo away nosy, camera-toting tourists snooping around asking questions about the display of dried animals. Ning Liu, a young Chinese ecologist, whispers that we’re “kind of pulling on their nerves” with all of these photos and questions. Traditional Chinese medicine is facing unprecedented scrutiny these days, and the white-coated workers know it. Animal parts from more than 1,500 species are used as ingredients in traditional Chinese medicine, and some of them, like tiger bones and rhino horns, have contributed to significant declines in species. 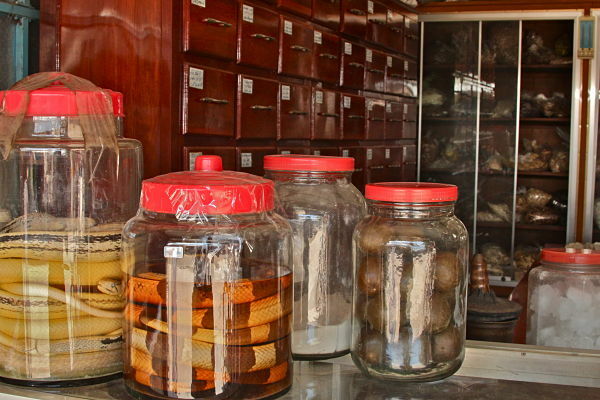 But many traditional Chinese medicine practitioners consider these components irreplaceable: “Everything has its place in treatment,” says Jun Zhou, a Chinese medicine specialist at the Dalian Shengu Traditional Chinese Medicine hospital in Dalian. After visiting three different Chinese medicine clinics, Zhou is the first practitioner who agreed to answer questions. While rigorously massaging a patient who has just undergone hot cupping therapy, Zhou says he considers all of the ingredients as necessary, including endangered species products. Many Chinese apparently agree. Demand for traditional Chinese medicine is rising, as an increasingly affluent population associates wildlife products with status. There are supposed remedies for almost any condition. Soups made from the fetuses of anteater-like pangolins are said to increase a man’s virility. Ground turtle shells are prescribed for febrile diseases, to stop night sweats, or to nourish yin and subdue yang. Dried sea horses are used to treat problems like asthma, impotence and heart disease, while snake oil is rubbed onto achy joints. Many of these animals are already on the brink of extinction from over-hunting and habitat loss; the increasing demand by Chinese medicine for their body parts is making a bad situation worse, experts say. In China, rhinoceroses have already disappeared. The rhino products used for Chinese medicine are now all imported from other countries, Zhong points out, while tiger populations are also dwindling, and endangered Tibetan wolves are hunted down for medicinal ingredients. And this situation is only getting worse, he says. Chinese medicine treats the body holistically, says Ye Chen, a project manager at Zhejiang Chinese Medical University in Hangzhou. The practice draws on metaphysical rather than scientific principles and often slips under the radar of clinical tests and conventional scientific validation, leaving most remedies without any scientific proof of their effectiveness or even safety. But Chen doesn’t think it’s fair to put traditional Chinese medicine in the framework of the West’s evidence-driven medical treatments. “The philosophy of each is so different,” he says. For many patients, the pain treated is not physical but psychological, Zhong says, and many cures are based on illogical cultural beliefs. For example, Chinese medicine practitioners often concoct cures for disease by examining relations between written Chinese symbols for certain animals and certain diseases. In Chinese, the character for maple bark is fong, and similarly, arthritis pain is tong fong. This coincidence forms the basis of the belief that maple bark cures arthritis pain. If the word matches, Zhong says, they believe they have found a cure for the disease. The earliest evidence of the traditional Chinese medicine used today dates back to the Shang Dynasty, from 1600 to 1100 B.C. The practice relies heavily on time-tested remedies passed down through the centuries. Often prescribed for chronic disease rather than acute or emergency situations, traditional Chinese medicine is based upon the Daoist philosophy of balance between yin and yang. “Chinese medicine is a bit complicated,” Zhou says while he inserts acupuncture needles into a patient’s arm at his Dalian clinic, “not everyone has the skill.” Indeed, traditional Chinese medicine lacks the precise, balanced formulas of its Western counterpart; each patient’s prescription is prepared to order, using methods that seem haphazard to American eyes. In the pharmacy, workers rush here and there, flinging open cabinets, tossing a handful of one herb and a pinch of another onto silver trays. These concoctions will be sent home with patients to address a variety of maladies. Although the Chinese government has established laws banning the use of endangered animals like tigers and rhinos in medicine, “it still takes time to educate people,” Chen says. Housed in tiny wire cages throughout the duration of their 30-year lifespan, farmed bears are milked of their bile through a permanent hole cut into their body. This open sore exposes them to bacterial infection and often provokes massive cancerous growths. Today, bear bile harvesting is still legal in China. Recreational tours like the one Robinson embarked on still occur, and conditions of the bears are exactly the same as they were in 1993, Robinson says. Thousands of kilos of bile are harvested from 10,000 to 20,000 farmed bears using this method every year, Robinson reported in a 2009 article from the journal Animal Welfare, and this is considered humane by both Chinese government officials and bear farmers. About 180 manufacturers in China produce the 123 different types of products containing bear bile, which is effectively used to break down gallstones and help with chronic liver complaints, though synthesized drugs produce better results than bile. Arguing for the continuation of bile harvesting, Feng Lei, a Chinese journalist, wrote in March 2011 that “advocating the cessation of using bear bile powder is unrealistic” because it would be detrimental to “patients who are critically ill” and would impact the Chinese medicine industry (the total trade volume exceeds US$2 billion). Lei also claimed that bear bile is “still irreplaceable,” though this is a false assertion: over 50 herbal alternatives exist for bile. The active ingredient in bile, ursodeoxycholic acid, can also easily be synthesized in a lab. Lei produced no evidence support his opinions (article in Chinese). As with many other ingredients taken from wildlife, there is an abundance of drugs that perform the same task. Many doctors, however, push products such as bear bile after being “convinced” by farmers to sell their products, Robinson explains, while others, such as wealthy businessmen, impress colleagues and friends by giving bear bile as an expensive gift. Much of the bile is full of impurities, according to Robinson. Analyses of bile samples conducted at Animals Asia have revealed rust flakes, urine, pus, feces, cancer cells, bacteria and antibiotics, she said. In Vietnam, Dr. Huong Xuan Nguyen, chairman of Vietnam’s Traditional Medicine Association, found initial evidence linking contaminated bile consumption to liver and kidney damage. Vietnamese culture is closely linked to their northern Chinese neighbors, and many Vietnamese share a similar propensity for traditional medicine and wildlife products. Since 1985, Nguyen has treated ten patients for bile poisoning — two of whom apparently died as a result — and has been campaigning in Vietnam for the cessation of bear bile use even though he advocates use of other traditional remedies. Vietnam’s demand for traditional Chinese medicine came to a head in 2006 when a Vietnamese government official publicly announced that rhino horn had cured cancer in a family member. This sparked an immediate surge in demand, resulting in a huge spike in rhino poaching — over 330 dead — in South Africa for export to Vietnam. Meanwhile, probably the last member of Vietnam’s own ultra-rare Javan rhinoceros population was poached in May 2010, meaning the species is now most likely extinct in the country. Doug Hendrie, a conservationist who helped found the non-profit organization Education for Nature Vietnam based in Hanoi, has faith that the younger generation of Vietnamese is becoming more environmentally conscious, but this change may come too late for many of Asia’s species, including the Javan rhino. “Traditional beliefs are hard to undo,” Hendrie says. The rhino situation inspired TRAFFIC to conduct an exchange program between Vietnamese and South African police, rangers, and environmental department officers in October 2010 in an attempt to establish mutual understanding and curtail the problem. But at this point it’s still too early to gauge the success of their efforts. Western countries also play an important role in the trade. In 2004, TRAFFIC carried out an undercover survey of traditional Chinese medicine shops in San Francisco and New York. It identified illegal tiger and leopard bone, rhino horn, deer musk, and bear bile on the stores’ shelves. Leigh Henry, the TRAFFIC agent who conducted the survey and is now a senior policy officer at the World Wildlife Fund in Washington, D.C., found that just one store of 33 surveyed in San Francisco claimed to carry tiger bone, a promising drop from seven stores out of 22 in a previous 1999 survey. New York didn’t fare quite as well — 11 stores out of 27 carried tiger bone products — though Henry believes more aggressive awareness programs in San Francisco account for the discrepancy. 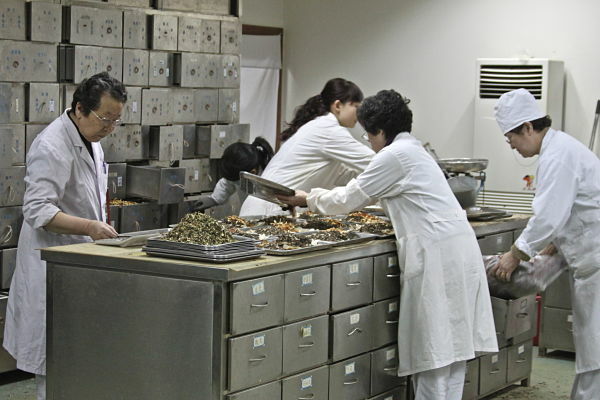 But there have been no follow-up surveys, and Henry doesn’t think any other organizations are monitoring traditional Chinese medicine trade these days. Visiting New York’s Chinatown today, customers can find products like “the copulatory organ of the male deer” and “harp seal complex” on the shelves, but any products depicting tigers specifically state in English and Chinese, “Does Not Contain Tiger.” A shop owner at the Ewa Trading Company on Mulberry Street, when asked if any tiger or rhino products are available, replied, “No, I haven’t seen that in a long time.” Jeffery Chen, owner of an acupuncture and herb shop on Baxter Street, said these products are all banned and “you have to go back to [Asia]” to get them. Whether questioned in Chinese or English, owners at several other shops also denied selling rhino or tiger products, though some say simply that they are hard to find and one pharmacist suggested to “check East Broadway” for acquiring these products. This small triumph can be attributed to the two-fold efforts of TRAFFIC and the U.S. Fish and Wildlife Service, though Henry insists that enforcement is still not adequate for preventing the sale of illegal wildlife products for traditional Chinese medicine. “It’s not for lack of dedication on the part of the officers,” she says, “it’s the fact that we have so few.” From 2000 to 2009, the U.S. Fish and Wildlife Service seized hundreds of illegally imported animals and their body parts, as reported on the CITES trade database. Confiscations included 243 bears, 141 tigers, and 85 pangolins (the data are broken down here). These individual cases numbers could refer to a single animal or could represent hundreds of body parts like bones, scales, or claws. For those cases in which the country of origin was specified, 42 percent of tigers, 41 percent of bears, and 28 percent of pangolins came from either China or Vietnam. Protective laws are in place, such as the Endangered Species Act and the Rhino and Tiger Labeling Act, which makes it illegal to sell products even claiming to contain rhino or tiger parts. But Henry laments that wildlife protection isn’t a higher priority for the U.S. government. “Budgets for conservation have been slashed immensely,” she points out, referring to a current proposal by the leadership of the House of Representatives to cut Fish and Wildlife Service multinational species conservation funds by 32 percent. “It’s an all-out attack on wildlife conservation,” Henry says. And there’s no question that the U.S. plays a role as a consumer and supplier of traditional Chinese medicine products, like bear parts from the American black bear and American ginseng, says Craig Hoover, chief of CITES operations at the Fish and Wildlife Service. He notes, however, that “we’re not the world’s biggest consumer and we have a number of laws that really allow us to deal with the problem fairly effectively.” With 120 wildlife inspectors working at U.S. ports of entry and 200 special agents undertaking more involved investigations around the country, Hoover has confidence in the combination of outreach, education, and effective law enforcement to keep a lid on illegal trade. TRAFFIC agent Henry, however, warns that it’s dangerous to believe that illegal trade is ever under control, even though things have vastly improved since the first Chinatown market surveys in 1999. It seems that the trend supports an increasing number of animals and their products turning up in the Fish and Wildlife Services investigations. In 2000, 23 bear seizures were made; in 2009, that number was up to 38, well above the annual 24 average seizures during that ten-year period. Similarly, from 2000 to 2009, tiger confiscations leapt from 13 to 24 (average 14 per year), and pangolins ricocheted from five to 19 (average 8.5 per year). It’s hard to tell the direction things are going. On one hand, strengthened law enforcement might mean more seizures, or maybe more illegal imports are just finding their way to the U.S. Very Good articles especailly for me because I am a second year student at Yo San University…which I would love to be able to do more research with the herbal treatments and acupuncture treatment. We as students must do research to change the opinion of Westerners. Most people in America just don’t understand how Chinese Medicine work and some believe that it is a scam…until we document cases and do case studies, we will be uncertain how it work and the effectiveness of the medicine. Even independent studies have increased my knowledge of the medicine. So go farward and do your own research and get it published. I know this wont go down very well with some people! I cant wait for the human species to go extinct, so all the other species will no longer suffer at the hands of humans. I would gladly provide financial support o the invention of a weapon that would wipe out ALL humans but didnt cause any harm to other life on planet! If TCM is so wise and knowledgable about side effects, then why was the toxicity of birthwort and lead oxide (galena, mi tuo seng) completely unknown until scientific research was done? Or cinnabar and calomel? I suppose next you’ll be telling me the lethal side effects of birthwort can be counteracted as long as you take some other herb(s). How can it be, if the toxicity is a recent discovery? TCM surely can’t evolve that fast. Can you counteract the carcinogenity and cardiotoxicity of tobacco by taking herbs? Google “medicinal cigarettes”; you’ll be surprised at how EXTREMELY wrong traditional knowledge can be. Superstition is superstition, regardless of whether it’s widely taught or not. Writing a thousand pages about complete and utter nonsense doesn’t make it true. You can now add donkeys to the list of exploited animals. Production of ejiao is threatening donkey populations across the globe.